Standing tall at 8.5m, this custom built Corocord Majestic Crown Tower has been drawing crowds to Stockland's new Oceanside Sales Office since its grand opening in July 2015. The unique 3 tiered tower was designed as a modern day viewing platform, providing unobstructed views of the surrounding landscape and development process. Visible both day and night, the tower has become a shining beacon within the local community, transforming the destination into an important hub for visitors and locals alike. 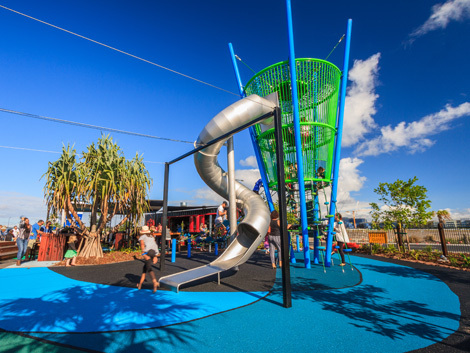 The tower features multiple access points via three external climbing nets, providing varying degrees of play opportunities and challenges for children of all ages. A giant slide provides the ultimate incentive for climbing interaction, as user’s race down the twisted stainless steel tube. 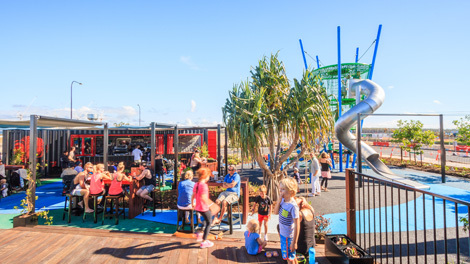 Ocean designed rubber softfall, retractable shade sails and a pop up cafe also accompany the popular playspace, ensuring a unique destination the whole family will enjoy.